MMO games, including MOBAs, compose 21 percent of the worldwide digital game market and are on track to generate $11 billion in revenue this year alone, SuperData Research reports. By 2017, that number is expected to rise to $13 billion. In 2014, the No. 1 MMO in terms of revenue is League of Legends, which has so far generated $946 million, beating out subscription games such as World of Warcraft, which is No. 4 on the list with $728 million. World of Tanks comes in at No. 5 and represents the largest revenue gap on the graph at $369 million. Dota 2 is No. 9 with $136 million, and Hearthstone: Heroes of Warcraft is No. 10 with $114 million. See the full graph below. 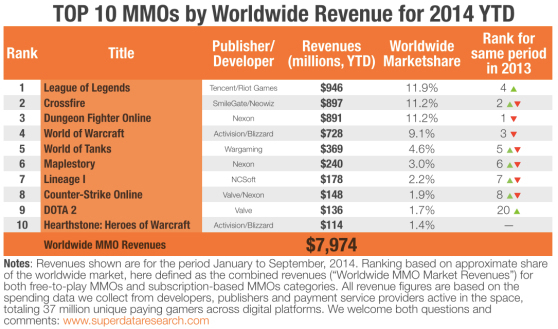 Free MMOs with in-game purchases generate more revenue than subscription-based MMOs worldwide, the report says. "The recent news that World of Warcraft saw a 600,000 increase in its subscriber base in the lead-up to its new expansion, Warlords of Draenor, silenced critics of the subscription-based MMO revenue model," SuperData says. "Generating well over $1 billion in annual revenues, the game is on track to tally 8.2 million subscribers by the end of the year. Its underlying mechanics have changed, however, as World of Warcraft now also offers microtransactions and a partial free-to-play component. It is a sign that things are changing, especially for the major publishers, when a company like Activision retires Titan and, instead, doubles down on Heroes of the Storm."